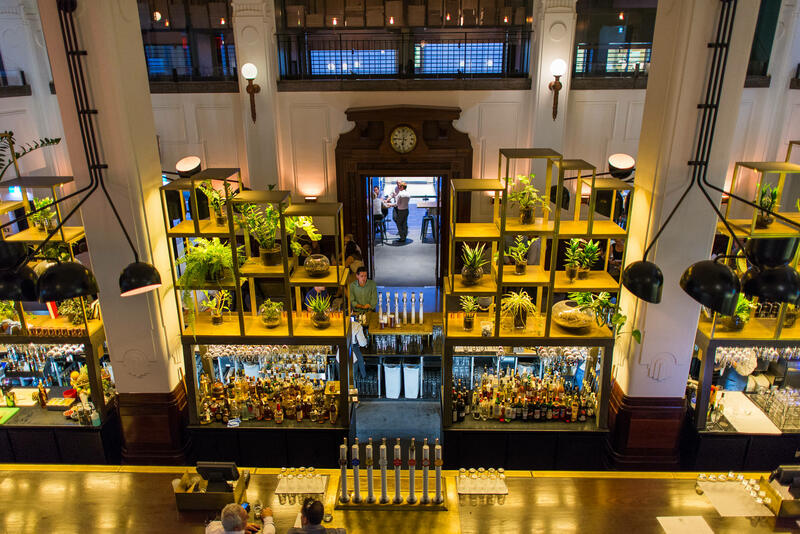 Brookfield Place was unveiled last year and opened up a host of new restaurants and cool bars in the Perth CBD. There’s an air of sophistication as you walk through the precinct, which combines modern architecture and thoughtfully restored heritage buildings. If you haven’t visited Perth since early last year, there’s an impressive line-up of venues to explore and experience here. Last week, Jac and I attended the Brookfield Place Progressive Dinner, an Eat Drink Perth event which would take us on a gastronomical journey through four Brookfield Place venues. There were around 25 people participating, mostly couples or groups of friends. We assembled at Bar Lafayette, located on the ground floor of the old Perth Technical School, for a cocktail and entrée. First the drink, called Bloody Income Tax, made with Beefeater 24 London dry gin, Dolin de Chambery Dry and Rouge vermouth plus bitters and Bar Lafayette’s own handmade spiced blood orange soda. I’m not a big fan of bitter aperitifs; this one was particularly medicinal and not to my taste. I call this a pullface drink – despite wanting to look like a grown-up, I pull a face whenever I take a sip. 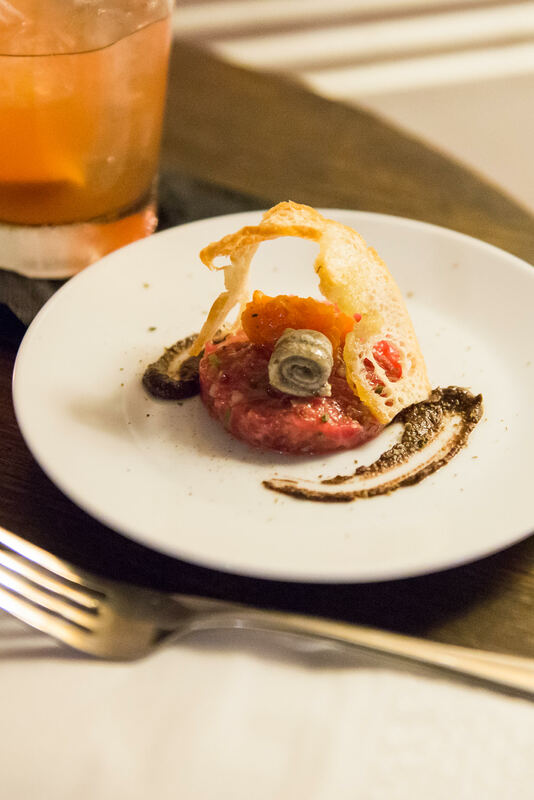 We had better luck with the entrée, which was steak tartare – well seasoned raw beef mince with chopped capers, served with olive tapenade and a rather millipede-like, meticulously rolled anchovy and soft cooked tomato underneath a golden archway of crispbread. 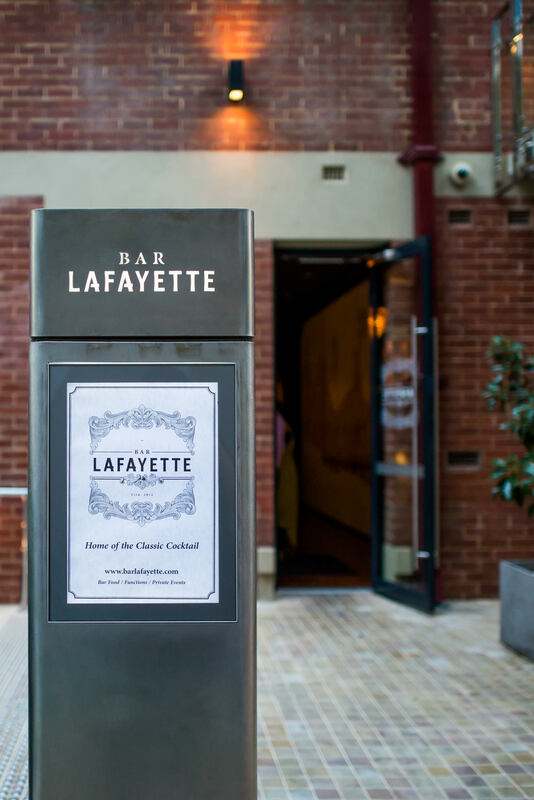 I’ve been to Bar Lafayette a couple of times now for drinks and each time found the staff to be very friendly as well as the full bottle on cocktails. I’d like to come back for a Green Lady, made with Hendricks gin, lime and mint, and give the bar food menu a go. BBQ Pork buns and marinated grilled prawns with avocado, coconut and lime dip sound pretty good to me. Ready for the main course, we ambled across to The Trustee. The floor-to-ceiling glass-enclosed wine cellar makes a stunning centrepiece as you walk in. We were ushered into a dining room where tables had been pushed together to create two long tables for our party. We were ready for something more substantial. The plates were large and as we discovered, the food deceptively rich. 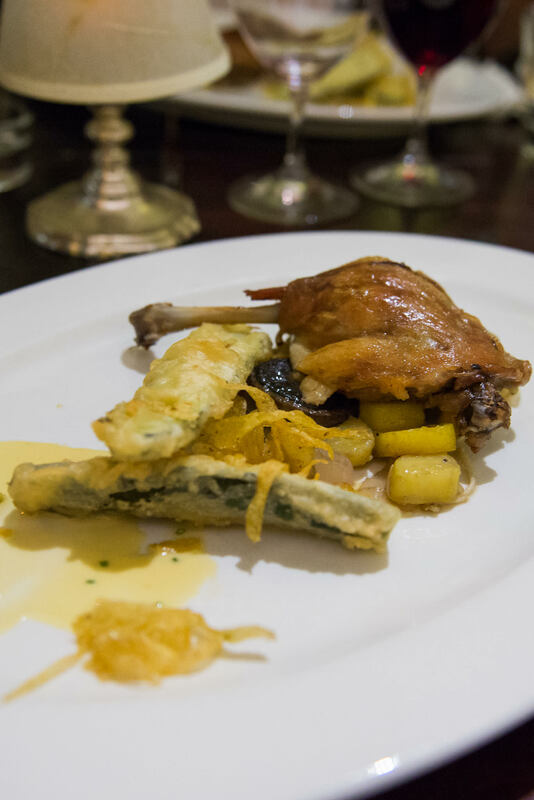 The main course was confit duck, rendered potatoes (which we delightedly translated as potatoes cooked in duck fat), wild mushrooms and beignet courgette. The duck fell off the bone easily and the crisp battered courgettes were delicious. But the clear winner was those tender fatty potatoes. The only thing missing was a simple leaf salad to cut through all the richness and fat. The matching wine was from Pemberton: 2010 Pemberly Pinot Noir. We strolled to Print Hall for dessert. 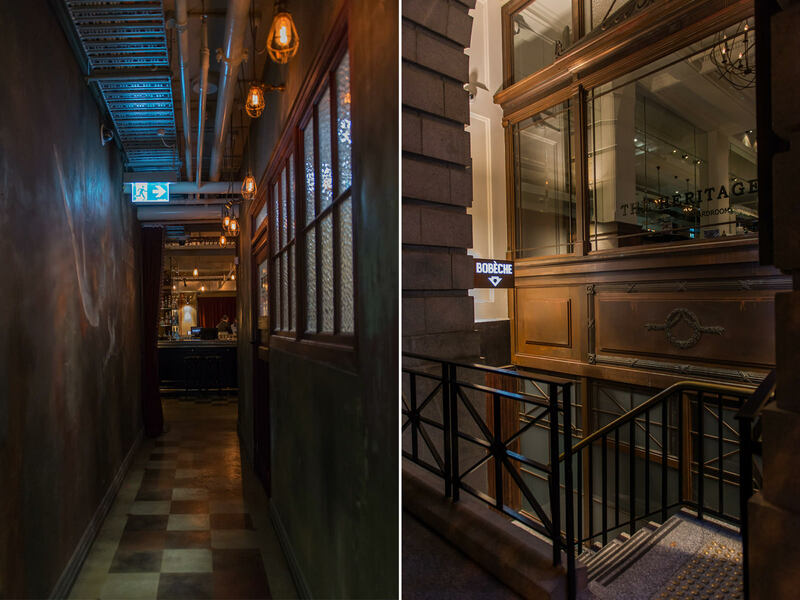 Currently, Tuesdays are all-day oyster frenzy at Print Hall, and Perth’s king of oysters Jerry Fraser was in the house (you might like to read my recent post When an oyster hater met the King of Oysters). 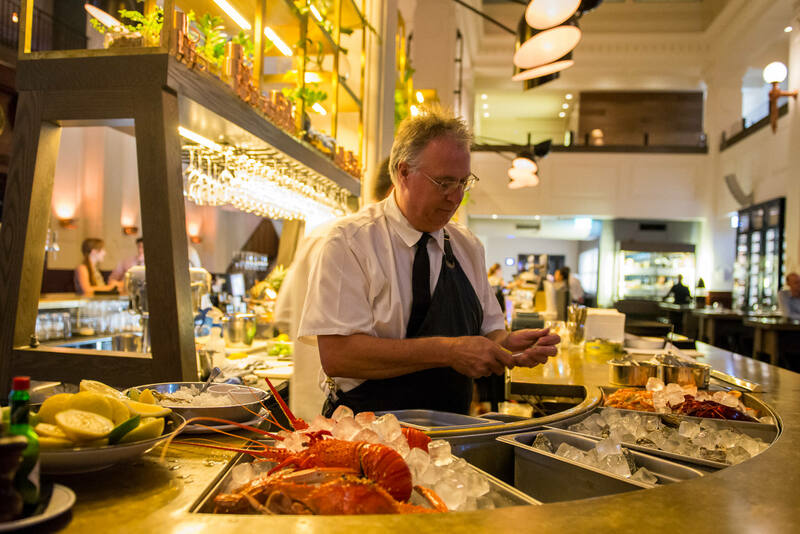 Print Hall’s got a new seafood platter menu in the main bar, and you’ll find more than oysters buried beneath the ice – there’s cooked crayfish, crabs, yabbies and prawns, all bright and fresh. Sadly, there was no room among all the duck and potatoes. “Another time,” we told Jerry. Two mini desserts were delivered, along with a glass of moscato dessert wine. 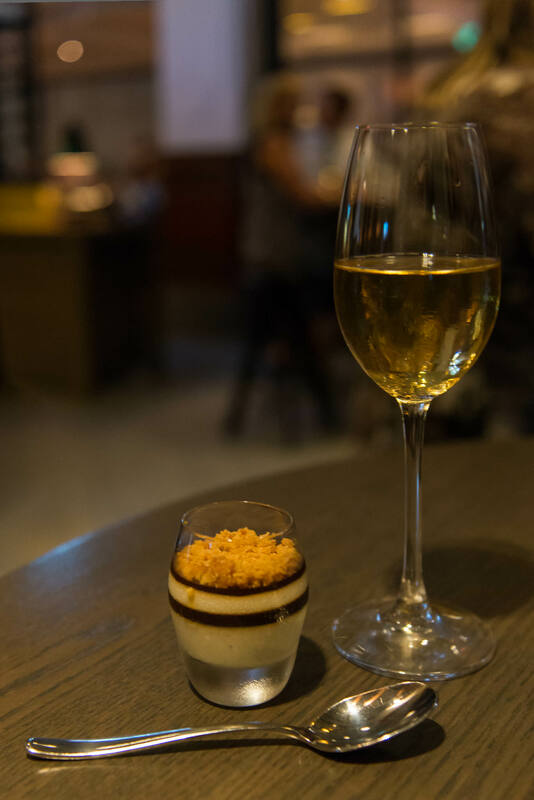 First, coffee panna cotta, a delicate vanilla panna cotta layered with a coffee gel, topped with crumbs. This was my favourite of the dessert dishes. I like sweet wines and the moscato was very easy to drink. Second, mini lemon meringue pies. 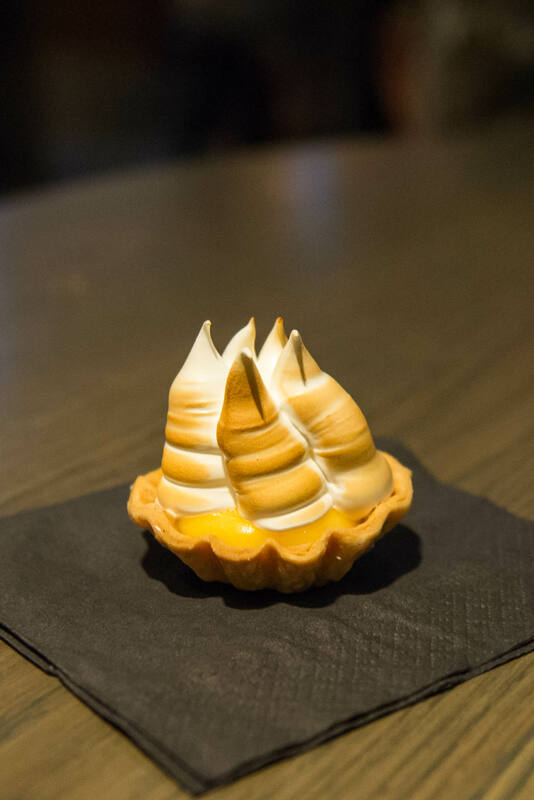 There may be a dress code in this joint but no one can look dignified when they bite into such soft, tall meringue. Meringue moustaches all around – cheers and bottoms up! Dress code: Upmarket casual or business attire at all times. Gentlemen must wear a collared shirt or collared jacket. No thongs or shorts at any stage of trade. 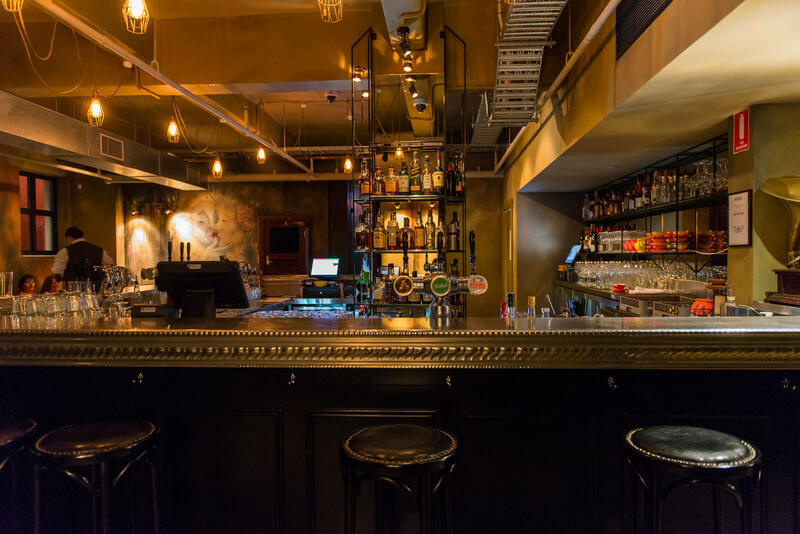 The final stop in our progressive dinner was Bobèche, a dark and cosy 20s speakeasy-style bar, located at the basement of The Heritage. 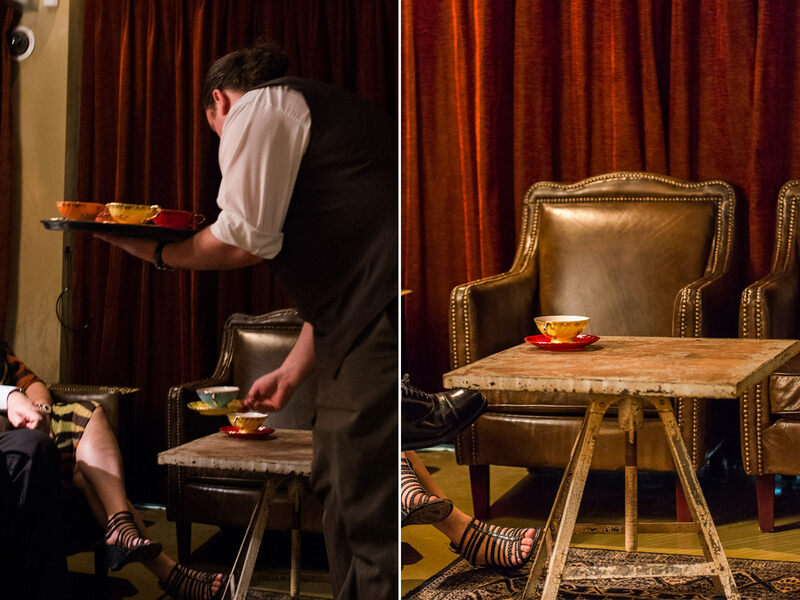 We sat wherever we like, most sinking into soft leather lounges and old fashioned armchairs. 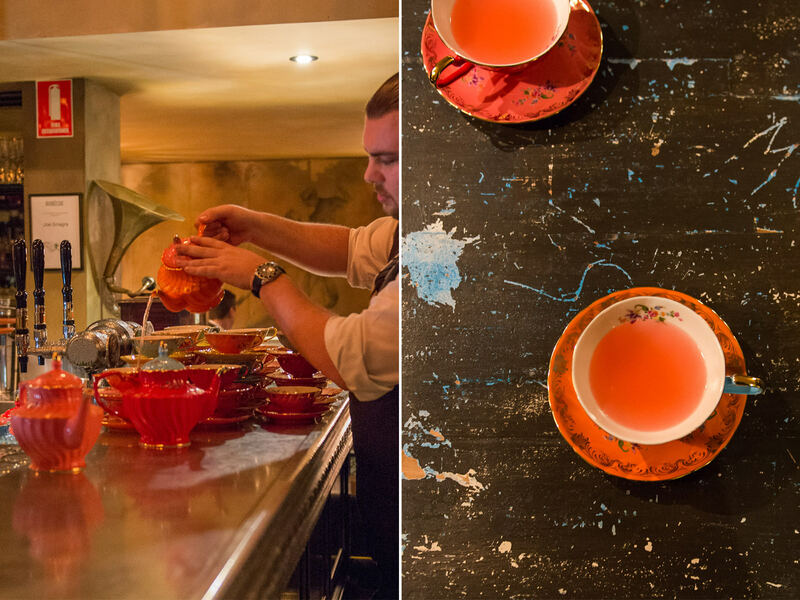 The Bobèche iced tea is a fragrant, refreshing brew, Bobèche’s version of Long Island iced tea, served chilled in teapots, poured into large china cups. It’s made from Absolut Vodka, Beefeater Gin, Havana Club 3YO Rum, Cherry Herring brandy, sweet spice tea (yes, there is real tea in it), fresh lemon and lemonade. It’s usually $62 per pot, which serves around 4 people. After checking out Bobèche’s menu (of course – as always, planning the next meal while enjoying the current one) I’d like to return and share a teapot of sangria with friends and try some of Bobèche’s food – a double decker club sandwich and some cheese – two of my favourites are on the menu, Marcel Petite Gruyere de Comte and Papillon Roquefort. Jac wasn’t so keen on the basement location of Bobèche – she likes open windows, sunshine and even better, sitting outdoors. I’m like our cats – I quite like a dark, cosy nook to curl up in. In fact, the armchairs and low tables were just begging for a naughty cat or two to jump on them. The walk down the stairs and a dark corridor to access Bobèche adds an air of mystery and excitement (unless you’re Jac). Just for a while, you’ve escaped to a different world. It’s a shame progressive dinners tend to be scheduled on the quieter hospitality nights i.e. 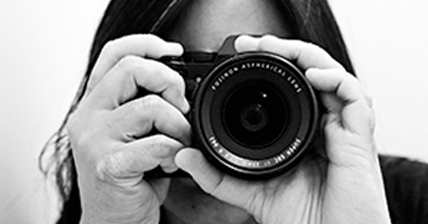 not a Friday or Saturday night – this one was on a Tuesday night – I’d loved to have lingered over the after-dinner drinks but we didn’t want too late a night out as we had to go to work the next day. 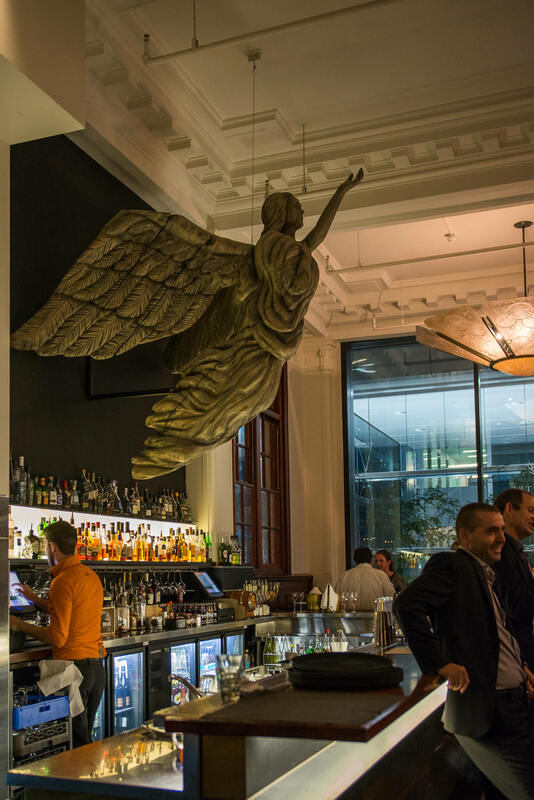 The progressive dinner was a great way to experience a number of venues in Brookfield Place. 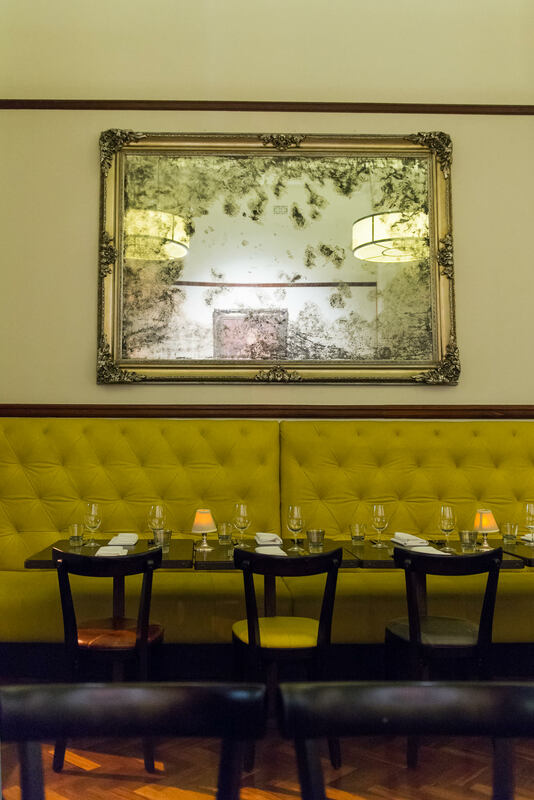 A couple of days earlier, we were emailed the menu and asked if we had any special dietary requirements – we had no issues and really enjoyed the meal. The venues were all an easy stroll apart – there was more chewing and chin-wagging than walking! 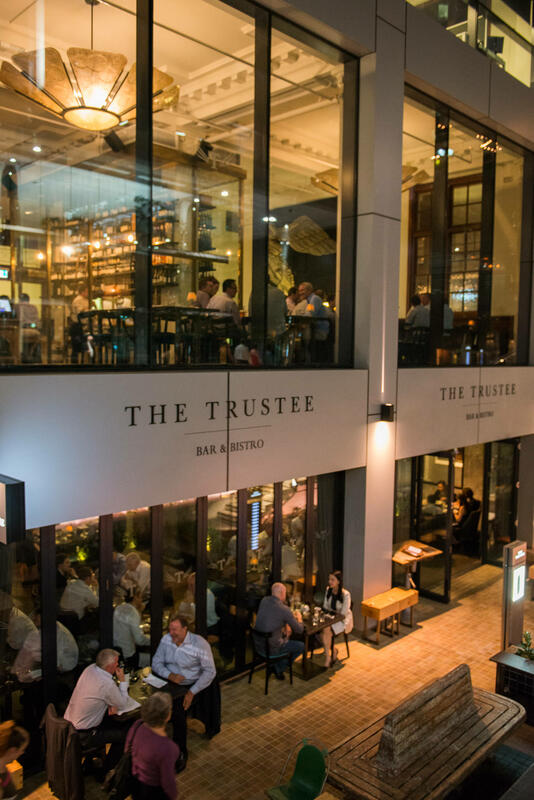 The dynamics of being in a group of 25 mostly strangers are interesting; especially at The Trustee, where we sat at two long tables – the shyer, less sociable people may not feel so comfortable with a shared table setting. 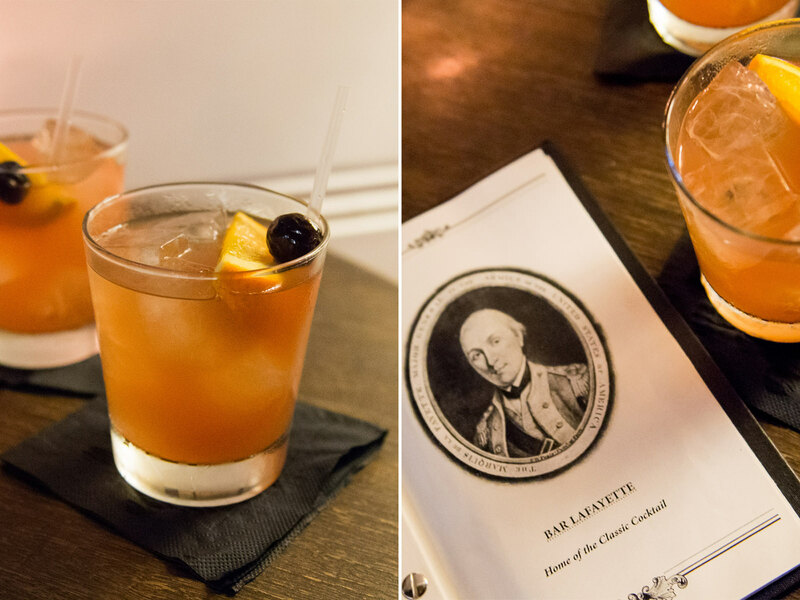 But it was easy enough to be in your ‘own space’ at Bar Lafayette, Print Hall and Bobèche. 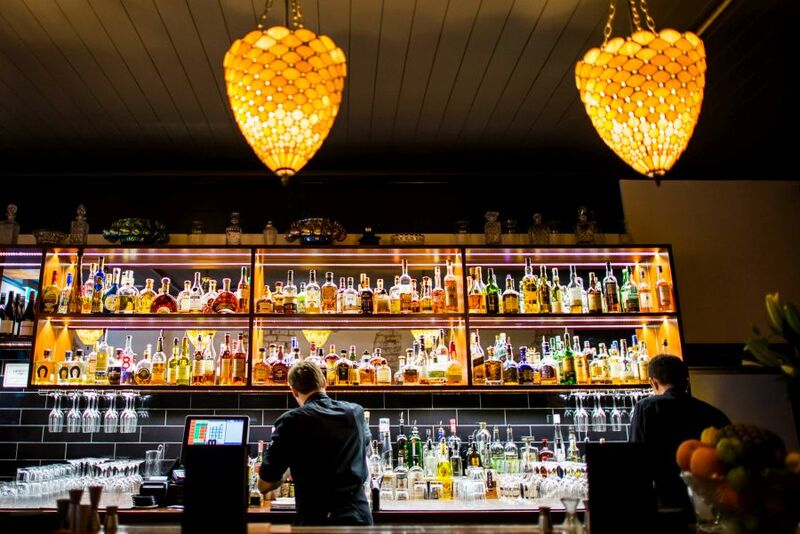 All Brookfield Place progressive dinners offered during Eat Drink Perth were sell-outs. 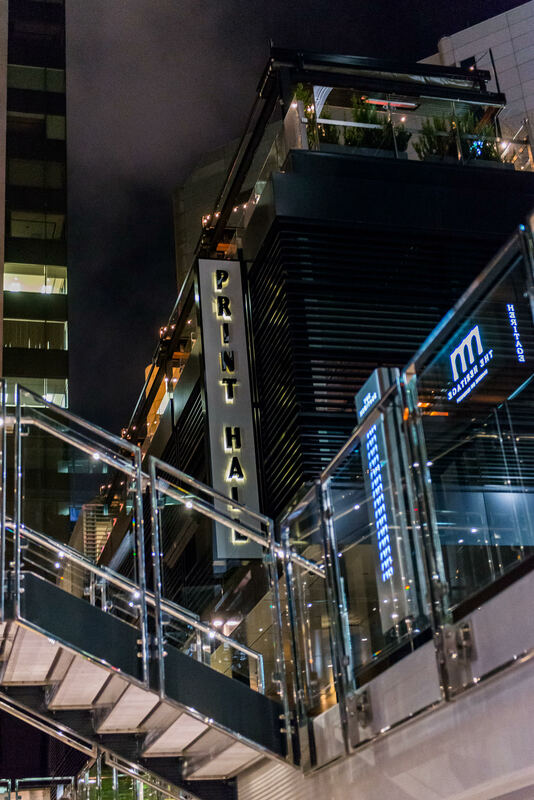 If you missed out this time around, I hope you won’t have to wait a whole year to experience a Brookfield Place progressive dinner… that’s a big nudge and hint to the organisers! 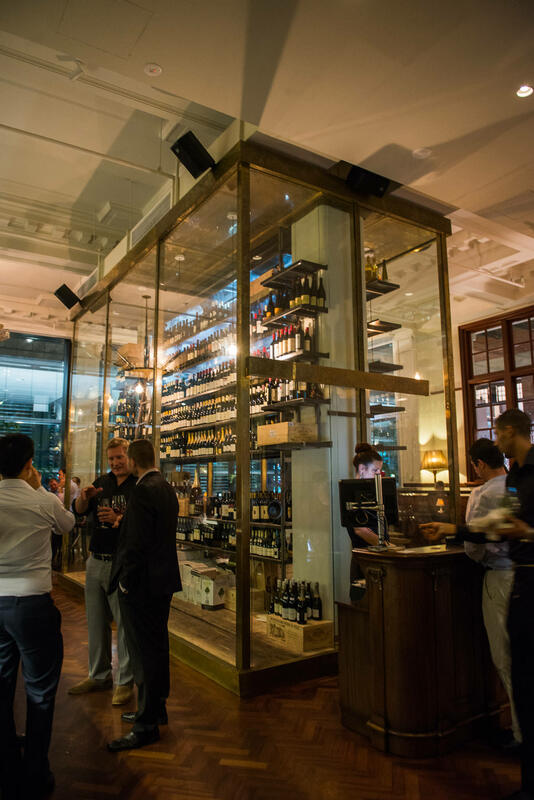 The Brookfield Place Progressive Dinner was an Eat Drink Perth event – AU$140 per person. TFP and Jac dined as guests of the City of Perth and Brookfield Place as part of Eat Drink Perth.